Handicapping motivation is a difficult angle for sports bettors but South Florida does little to invoke confidence with a QB on the wrong side of questionable and a vacant OC position in the midst of a five-game losing streak. Handicapping motivation is a difficult angle for sports bettors but South Florida (7-5 SU, 4-8 ATS) does little to invoke confidence in the Gasparilla Bowl vs. Marshall with a QB on the wrong side of questionable and a vacant OC position in the midst of a five-game losing streak. While other teams enjoy bowl festivities abroad, the Bulls get to mull over what could have been after starting the season 7-0 while staying home in Tampa as a 3-point underdog. Ranked in the top-25 entering Oct. 27's date with Houston, USF had aspirations of surpassing UCF as the Group of 5 bowl at-large. Instead, the Bulls ended the regular season with five consecutive losses with an average point differential of minus 19.4. They were torched by the Golden Knights 38-10 despite McKenzie Milton's injury and now are dealing with a QB injury of their own with junior Blake Barnett (shoulder/lower body). __MORE:__ [2019 Heisman odds](https://www.betchicago.com/2019-heisman-odds-tua-tagovailoa-trevor-lawrence-jake-fromm) Barnett was able to shed his walking boot on Sunday but reporters don't like his chances to start on Thursday. 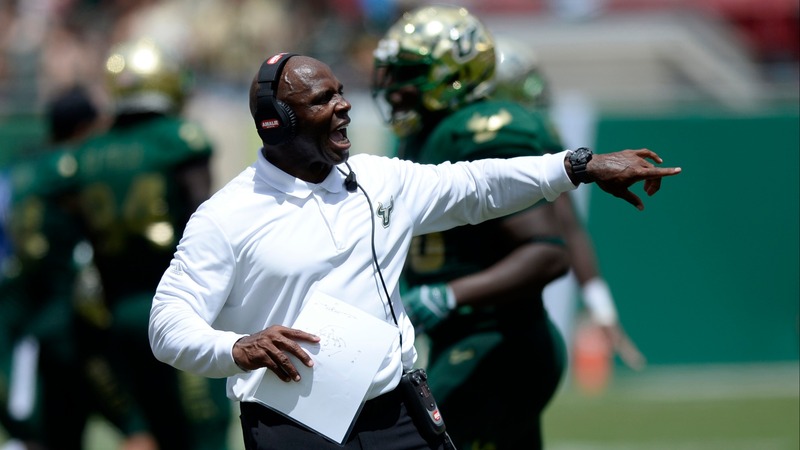 Based on what we saw from USF backups Chris Oladokun and Brett Kean vs. UCF las time out, things could get ugly quick vs. Marshall's defense ranked 12th nationally in success rate and 15th in sack rate vs. a Bulls offensive line that is ranked 114th on passing downs. Oladokun finished 7-for-12 for 77 yards with one pick against the Knights, while Kean was 8-for-17 for 36 yards. Neither QB had an impact on the ground for an offensive unit ranked 16th in rushing explosiveness. <a href="https://twitter.com/TBTimes_Bulls/status/1074730899206533120" class="embedly-card" data-card-width="100%" data-card-controls="0">Embedded content: https://twitter.com/TBTimes_Bulls/status/1074730899206533120</a> While USF stumbled into the Gasparilla Bowl, Marshall (8-4 SU, 4-8 ATS) won its last three scheduled games before Virginia Tech administrators decided they wanted to make up a game on Dec. 1 so that the Hokies could become bowl eligible. It was a clear letdown spot for the Herd and the 41-20 road loss should be taken with a grain of salt. This Marshall team is essentially the Northern Illinois (great defense/poor offense) of the MAC expect with an opposite bowl record. Marshall coach Doc Holliday is 5-0 SU and ATS in bowl games and has won the Gasparilla Bowl twice since 2011. While Marshall does struggle offensively, it does have an outstanding WR in Tyre Brady, who at 6-3, 206, will be closely watched by [NFL scouts on Thursday](https://twitter.com/nfldraftscout/status/1075077255892619265). With USF ranked 106th in big-play rate allowed and 124th in third-and-long success rate, Brady and fellow 6-3 WR Obi Obialo should be plenty of chances to impress if dual-threat QB Isaiah Green can remain accurate. ## Marshall vs. South Florida Gasparilla Bowl betting pick With Barnett likely out and South Florida struggling to produce points as it limps into the offseason, UNDER 52 is the play I like most. The Bulls also rank outside the top 100 in a number of red zone categories, while Marshall is 127th in success rate inside the 10-yard line. Marshall has the clear advantage on defense but struggles overall on the other side of the ball, ranking 125th in points per scoring opportunity, 101st in rush efficiency and 104th in passing completion rate. (Additional pick from colleague Chris Mascaro: Marshall (-4): Once a five-star recruit at Alabama, USF quarterback Blake Barnett must realize his dream of becoming an NFL draft pick has likely fallen by the wayside. But maybe an NFL team gets an injury in training camp and wants to bring the 22-year-old in for a look, it's possible. The Jets brought former Wake Forest QB John Wolford in for their final preseason game this season, and he [put off a career in finance for a week to live out his NFL dream](https://nypost.com/2018/08/28/jets-quarterback-hopeful-could-be-on-wall-street-right-now/). What's my point, exactly? Well, Barnett, who threw 11 picks in 10 games this season for the Bulls (7-5, 4-8 ATS), was in a walking boot just last week, so don't expect him to risk further injury in a meaningless bowl game. Meanwhile, Marshall (8-4, 4-8 ATS) had to go take a beating in the rain at Virginia Tech earlier this month because [the school was paid $300,000 so the Hokies could reschedule a cancelled game to become bowl eligible](http://www.espn.com/college-football/recap?gameId=401100159). The Herd could've folded up the tent after being down 34-6 going into the fourth quarter, but they scored twice to at least make the final score (41-20) more respectable. This team has fight. USF is playing in its home stadium, but they've been outscored 79-25 there the last two games.) # 2018 college football bowl game odds ## Gasparilla Bowl betting lines, odds and prediction ### Marshall vs. South Florida 7 p.m. CT on ESPN; odds provided by MGM. __Point spread:__ Marshall -3 __Total:__ 52 __Betting line movement and games notes:__ First to post opening Bowl lines in Las Vegas, Caesars posted the Bulls as early favorites on Dec. 2 but most books in town listed Marshall as the 2-point favorite on Dec. 3. As of Tuesday's writing, Vegas sportsbooks have Marshall as the favorite between 2.5 and 3 points. The total has seen the most movement with Barnett's status in doubt, moving from 55.5 to as low as 51.5 at the Westgate LV SuperBook. __S&P+ prediction:__ Marshall 25, South Florida 24 ### Marshall betting records, stats 2018 SU record: 8-4 2018 ATS record: 4-8 2018 O/U record: 8-4 S&P+ rank: 49 Off. S&P+ rank: 110 Def. S&P+ rank: 13 Special Teams S&P+ rank: 96 __Note:__ S&P+ rankings are an advanced data set of tempo- and opponent-adjusted components of the five factors of college football: Efficiency, explosiveness, field position and finishing drives. Per creator Bill Connelly, a fifth factor, turnovers, is informed marginally by sack rates. __Play and win:__ [Join our free contests](https://betchicago.chalkline.com/) ### South Florida betting records, stats 2018 SU record: 7-5 2018 ATS record: 4-8 2018 O/U record: 5-7 S&P+ rank: 72 Off. S&P+ rank: 55 Def. S&P+ rank: 66 Special Teams S&P+ rank: 97 ## Marshall vs. South Florida, Gasparilla Bowl betting trends Marshall has won and covered its last six bowl games since 2009 but has failed to cover its last three road games this season. The Bulls are 6-12 ATS last 18 games overall and are 1-5 ATS in their last six games at Raymond James Stadium. OVER is 10-3 in Thundering Herd's last 13 games on grass.